In most situations, my 4-ingredient Garlic Dill sauce is where it’s at. It’s lemony, herby, and packed with tons of fresh garlic flavor. Recently, however, I’ve been reaching for something more subdued, especially when it comes to my falafel addiction. Enter: 3-Ingredient Tahini Sauce for Everything. This sauce was inspired by Wolf + Bear in Portland (one of my favorite food carts! ), which has me hooked on falafel salads with tahini dressing (and Tahini Bombs!). Upon investigating the texture and flavor of their sauce, I realized how simple it really was. Consider this my inspired version. This recipe couldn’t get any easier. 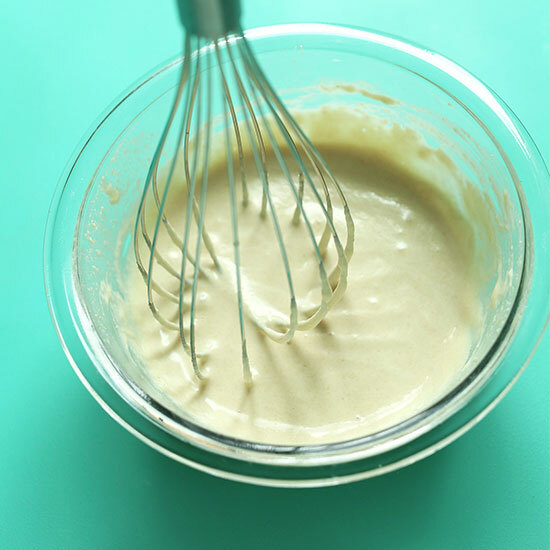 Sprinkle a little salt and garlic powder on tahini and whisk. Then add water and whisk. THAT’S IT. It’s hardly a recipe but it’s too good and simple not to share. And,one more dish that’s coming at ya soon. Stay tuned! In the meantime, if you try this recipe, let us know! Leave a comment, rate it, and don’t forget to tag a photo #minimalistbaker on Instagram. Cheers, friends! 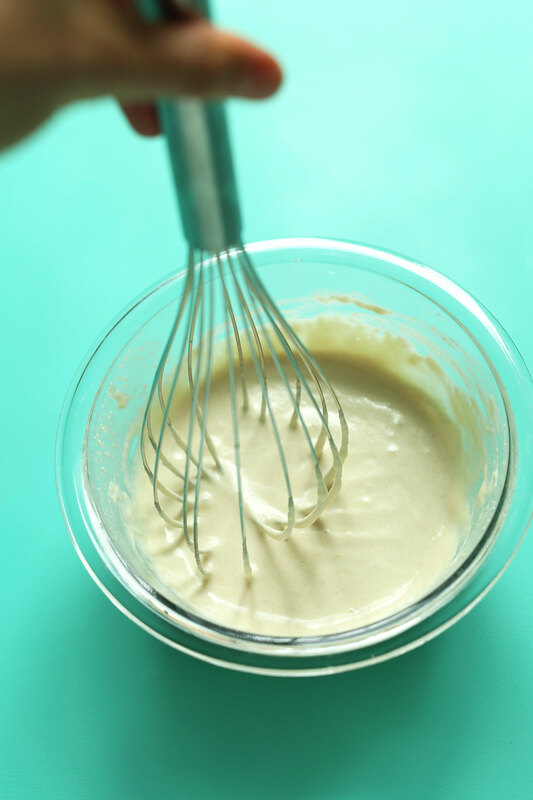 Creamy, savory tahini sauce with just 3 ingredients! 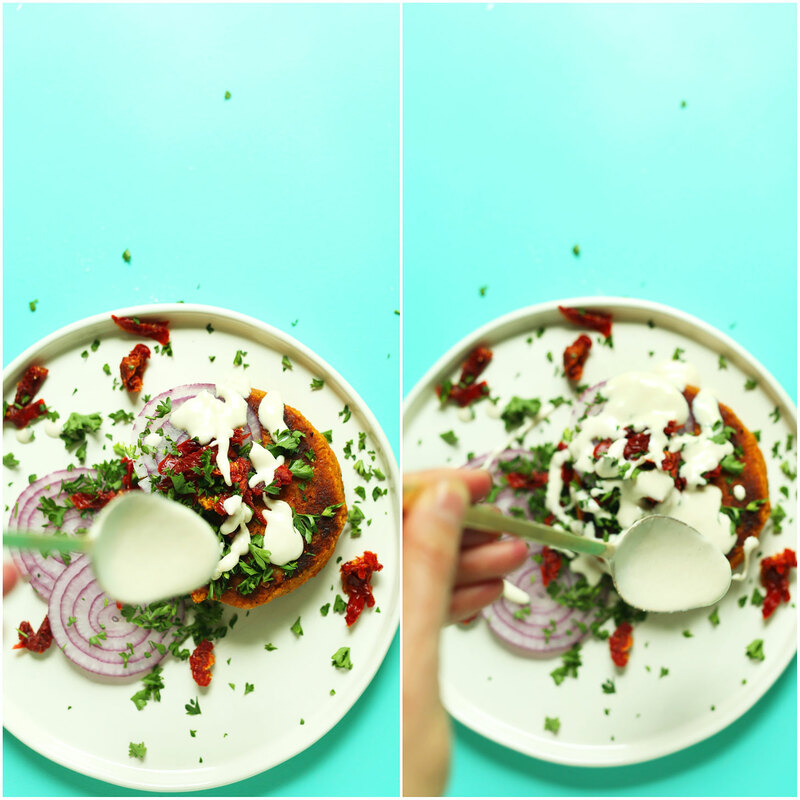 The perfect vegan sauce for falafel, salads, veggie burgers and everything in between! 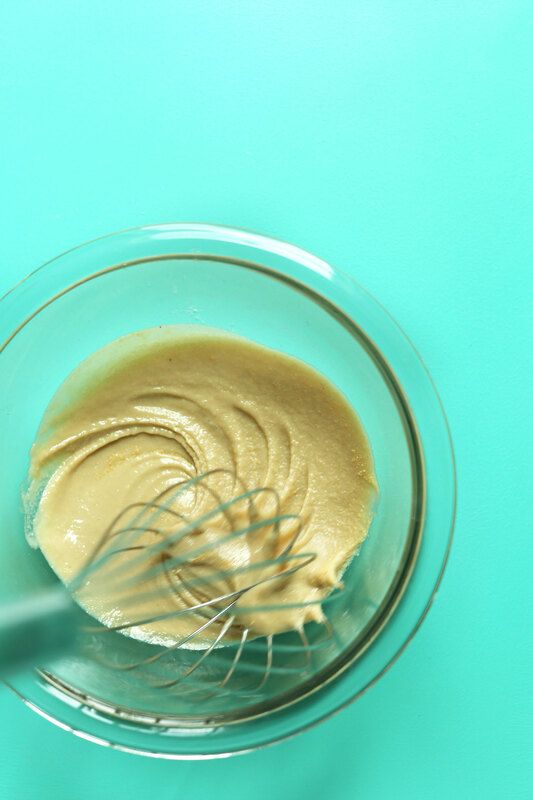 Add tahini, sea salt, and garlic powder to a small mixing bowl and whisk to combine. Add water a little at a time, continuing to whisk, until you have a creamy, pourable sauce. Taste and adjust seasonings as needed. Tahini is meant to be the prominent flavor, but add garlic powder for more garlic flavor or sea salt for saltiness. This sauce is ideal for falafel, salads, veggie burgers, and just about everything in between! It's ideal for dishes that need a creamy sauce that isn't overwhelmingly flavorful. Store in the refrigerator covered for 1-2 weeks. *Recipes yields about 2/3 cup as originally written, depending on how much water is added. Super delicious and simple recipe! We used this for Falafel wraps and it was a hit. We hope you love it, Liz! Yum. Although I ended up doubling the water, garlic, and salt and adding a bit of lemon juice. Had it over a riced cauliflower bowl with corn and kale – delicious! Thanks! How long will it last if I remove the garlic powder? I know tahini paste lasts over a year but how does it change when thinned with the water (if at all)? I’m not sure, Dan! Tahini paste lasts a long time by itself but this sauce will keep in the refrigerator covered for 1-2 weeks. So simple, so delicious! I add a tad of maple syrup to mine for some extra flavoring. I add the sauce to so many dishes, love your recipes. Thank you! Perfect recipe for roasted veggies!! Love it. So yummy and super simple! New staple! ? We are glad you enjoyed it, Eliza! I used to make a miso version of this however I no longer eat soy products. So this recipe was a great reference. I definitely used more than 1/4c of water. As others have mentioned… it got thicker and pastey at first. But keep on whisking and adding way more water. It will get to a nice creamy texture. I also added juice of about 1/2 of a Meyers lemon, to taste. I can also see adding a pinch of cumin. Used it over a veggie rice bowl. Delicious and satisfying! FYI: I used Trader Joe’s organic tahini. It was really separated in jar and pretty much unstirrable (it was in my pantry long time). I remedied that by warming in microwave on very low power – one minute at a time. Initially just stabbing thick stuff at bottom and then eventually stirring it all together. Thanks for sharing your recipe changes, KC! I use coconut aminos instead of soy sauce. Its delicious! Along with lemon juice, balsamic vinegar (the very thick one from Napa Valley) olive oil, cumin, garlic powder, onion powder and water. I’m considering using curry powder some time…but not now….I use this as a dip for fresh veggies…..lovely! 3 ingredients. Tahini, garlic powder, salt and water. This was a perfect dressing! My favourite is when you don’t have to look up a recipe! I’ll remember this one! Served it over an greens salad with strawberries, apples and avocado. Delicious! The more water I added, the thicker it got until it was an ususable paste. What am I missing? Hi Jamie! Hmm that shouldn’t be the case. Did you make sure to mix quite a bit, as you added more water? Did you change anything in the recipe? I followed the instructions exactly. The more I stirred, the thicker it got, no matter how much water I added. It was almost as if there was some sort of chemical reaction happening between the water and tahini. Hi! I suggest adding more water and it will eventually thin out. Can minced garlic be used instead of garlic powder? Yes, that should work in a pinch! This may sound strange but I have seen “ tahini paste” referred to when making this sauce. Does any one know where to get this paste? I just made your tahini sauce and added lemon. It was excellent! I poured it over a Mediterranean salad bowl! I added a little lemon juice and thought it was great! 1-2 weeks in the refrigerator! Absolutely love it!! I always have a batch in the fridge nowadays (in fact, one at work and one at home)! Yes, it sometimes needs more water than is stated in this recipe but it also depends on how solid/liquid the tahini is. I always find it difficult to stir it properly in the jar without making a mess, so generally the contents at the bottom of the jar are just a lot more dense and therefore the closer I get to emptying the jar of tahini, the more water I need to make the sauce. If that makes sense…. I just made this and want to say that if you plan to use it for a salad dressing, you will need to add way more water. I also added a squirt of lime juice. This was nearly a paste when I followed the recipe. For the dressing, I added the juice of 2 lemons and only 1 tbsp maple syrup. It was delicious! Does this keep well if stored in a jar? Yoi need to refrigerate it after it’s made. It keeps about two weeks. EUREKA!! I just wanted to follow-up and let you know that I made it work! I bought an entirely new brand of tahini (365 organic) because I couldn’t find any at Trader Joes. The same thing happened as I added the water – after 1/4 cup warm water it was a mushy mess. But, I kept adding more and more water and finally it got to the right consistency! I probably had to add 1/2 cup or maybe more but it worked! I think I was stumped before because I didn’t realize I would have to add a LOT more water than what the recipe originally called for. Thank you! I love this sauce and I put it on everything. But, I think I’m doing something wrong. Whenever I make it, it just becomes very thick (like hummus or thicker) instead of some consistency that can be easily drizzled. I add even more water than the recipe calls for, but it doesn’t seem to make a difference. Once I stir it up, it thickens. It still tastes very good, but it’s not really a “sauce” any more. Hi Laura, I’ve found that adding small amounts of water and continually whisking the sauce until it thins out helps! Let us know if it still isn’t working! I tried it again tonight and, alas, same result :/ I can’t figure out what I’m doing wrong! Maybe it’s my tahini (I use Once Again organic tahini)? Maybe the water is too warm? Maybe it’s too cold? Maybe I’m not whisking enough, or maybe too much? I tried adding the water just a spoonful at a time, and it just kept thickening. And then there was one point (I wasn’t quite at 1/4 cup yet), where the oil in the tahini really started separating and there was no going back. I want this to work so much because it would be so much better if I could just drizzle it on stuff! Thanks for your help! It could be that your tahini has gone bad? Maybe try another brand? Lately we’ve been using Trader Joe’s and have had great results! Also, warm water might help! Keep us posted, I want this to work for you because this sauce is a staple around here and it’s so versatile!! Well I bought some new tahini (same brand) and it worked a little bit better but still not ideal. Definitely at least pourable now but not exactly drizzlable. I think it must be the brand of tahini as you suggested. Next time I’m at Trader Joe’s I’ll pick up some of theirs and try again! In any case, it’s still a great dressing and sauce, no matter what form it’s in! double the water, maybe more. also, you may want to add some lemon or lime juice. Make sure the tahini is fully blended in the jar. Add water all at once. Use double the water. I just mix it with a spoon & it blends fine, but I also use lemon juice in mine. which may make a difference. Good luck!! Tahini is LOVE. It’s LIFE. I love it so so much! Wish I had tons of sesame seeds to make this! Can this be used as a substitute for a creamy pasta sauce? I have never tried tahini on pasta, but wouldn’t knock it ’til I tried it! I do know that using avocados, olive oil, lemon juice, garlic, salt, and pepper makes a GREAT creamy pasta sauce for cooked pasta or zucchini noodles! I know this is a little late but I thought I would put in my 2 cents. Happy saucing! Lol. Chinese Wuhan hot and dry noodles use tahini so yes, it can work. This looks delicious and easy to make, will definitely be trying it out ? I tried both versions, with and without lemon juice. Nice! Thanks for sharing, Steph! I did add a little squeeze of lemon juice but only cause I´d already cut one up and it was left over. But I tried both versions and liked them! BTW before I tried this sauce I was not a huge tahini fan at all. Tried this last night – my husband loved it (he’s Egyptian…so anything Tahini is love for him) but it just tasted like saltier tahini to me. I must not have a palette to discern the difference between this and tahini. It’s definitely a very mild sauce. For more kick, add a squeeze of lemon juice or a little maple syrup! Maybe some encouragement to shop local? I’m a fellow Portland gal and love all your recipes! Just a heads up, on my Android phone, when I load your blog the ads at the bottom of the screen block all the social media buttons and make it really hard to Pin the recipe. If I try to close out the ad, a greyed-out box still covers the buttons. I thought you’d like to know. ? Thanks Lisa! We will look into that! I added soms soy sauce and red pepper. Delicious! Thanks for this! 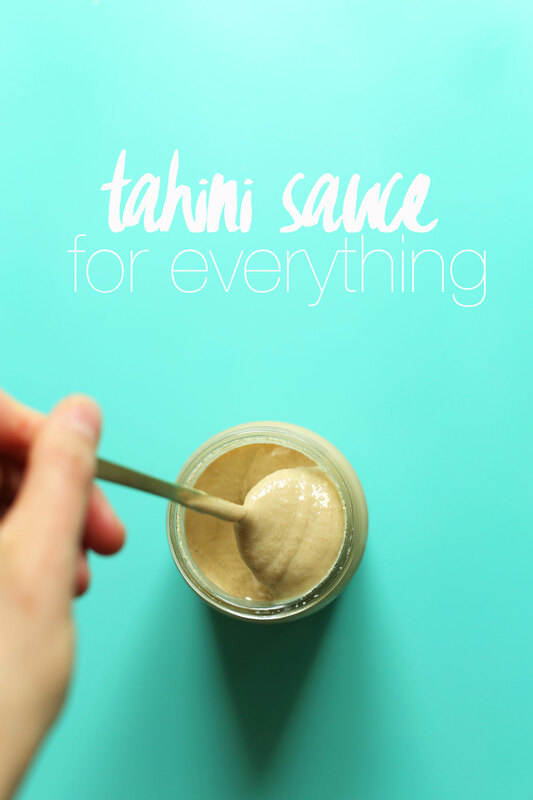 I’ve recently become OBSESSED with tahini and a simple recipe like this really hits the spot. Made this yesterday and it was great poured on a kale salad. Love simple recipes like these! The only struggle I had was that making tahini with my food processor took a long time, but after adding a little water it finally made it. By the way, this is the first time for me commenting here although I have made many recipes and I have loved them all. My dad’s favourite is One pot red lentil chili. Wow! love this….good idea…sometimes simple IS BEST! I’ve always loved simple sauces like this. They’re often better than the ones you put more ingredients and effort in to. And, you can never really go wrong with tahini. 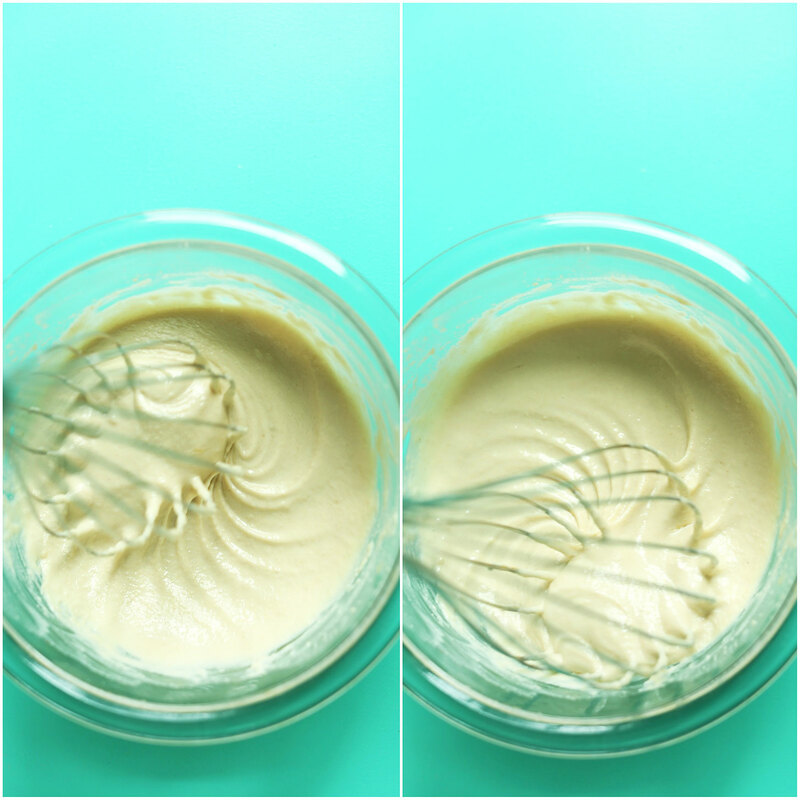 My 3 ingredient tahini obsession is: tahini, lemon & maple syrup with salt & pepper. But this sounds fabulous as well! Will try on my salad today. That sounds fantastic, as does the recipe above. Sometimes I just eat a spoonful of plain tahini. I love it so much! Maple syrup!!! Genius! Thank you for sharing. While I love this, it was still too bitter for me. Maple syrup is just what I need! Interesting, because my fave is tahini, garlic, lemon, and kikkoman teriyaki sauce. I think you hit the bullseye there! ? I love your 3 ingredient tahini sauce! Thank you, Thank you, Thank you.